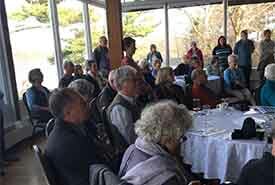 On May 7, the Nature Conservancy of Canada (NCC) held an open house to update the local community on work to establish the Halifax Wilderness Park. This proposal has come a long way, most notably with the Halifax Regional Municipality’s commitment in September 2017 to contribute $4,100,000 to establish the wilderness park. Close to 100 people heard that over $5,000,000 has been committed to establishing the wilderness park, and that an agreement has been reached for an access and parking lot. The creation of the wilderness park requires significant financial support from the community.